The first collaborative lure development between DUO & COREMAN. The developmental concept for the Deprive was to create a bigbait which fits in our usual seabass game. Most bigbaits on the market today are originally for the large mouth bass and can be quite stressful when using with spinning tackle due to weight and tailing (line picking up the hook) issues. The project initiated with our goals set to overcome these issues. DUO was responsible for the design and hardware, and COREMAN was responsible for the smaller action and other settings. Through the long road of trail and error, we have finally come to develop our first collaborative item. The unique joint section of the body design has a slight twist, creating a smooth initiation of action while allowing anglers to feel for the action action during retrieval. 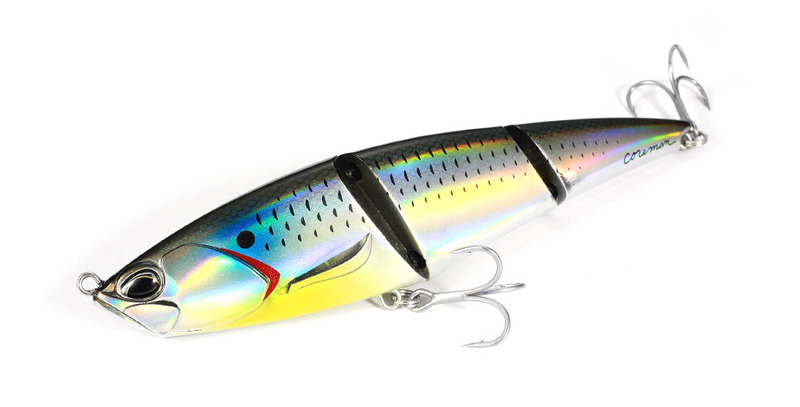 Thanks to the two jointed body sections, the lure performs a seductive S-curving action. It also creates the ever important “timing” to bite with its irregular action during its slalom. With its semi-suspending weight settings, it is a slow sinking lure in fresh water whereas a slow floating lure in the salt. It is a perfect lure for those massive seabass feeding on large baitfish in the open ocean or even around estuaries. We present you the “Deprive”, the perfect weapon to target the seabass feeding on massive baitfish! !